Samurai sword collecting is a very popular past time for many Americans. Something that is becoming even more popular is martial arts that make use of samurai sword for fighting and cutting exercises. I recommend this sword for decorative purposes. For a wallhanger, I have no complaints. The kanji script carved into the scabbard is very attractive and adds to the traditional look of the sword. All the wrappings are nylon, but look nice enough. Sword is not of the best quality, but worth the 15 dollar price tag. If you look at the sword detailed description, you'll see that it's made of HQSS stainless steel, already sharpened, with the hamon along the edge of the blade. But usualy it's not sharp enough to pass the paper test. 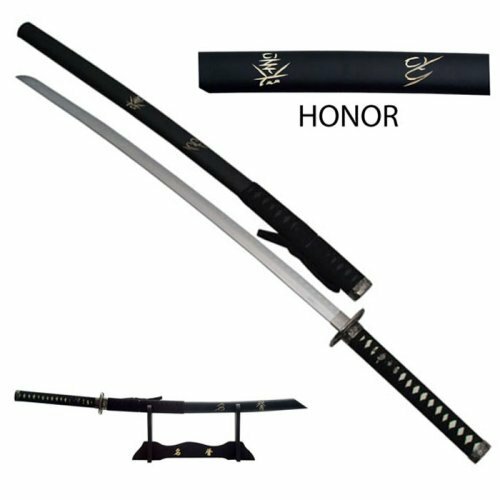 I also recommend to look at the Japanese Samurai Swords Buying Guide and How to buy your first Medieval Sword. The sword is beautiful and exactly as expected. The sheath is a black matte.